commodore64crap Explaining why the Commodore 64's BASIC V2 was crap and how some people managed to program the C64. The C64's 35th anniversary is nothing to celebrate! Leaving the Commodore 64 out of it for a moment, I recently got a big shock when a Texas Instruments TI99/4A programmer told me that the built in TI BASIC had no commands for hires graphics or sprites! 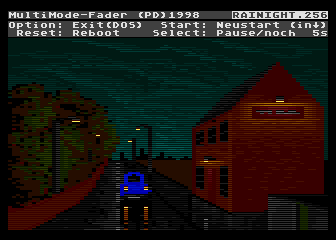 This is in spite of it also having a built in Graphics Programming Language (GPL). 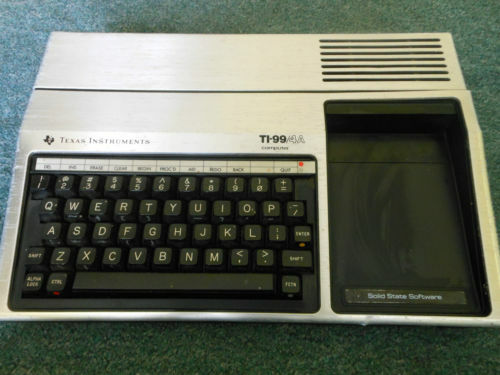 I now know that Texas Instruments wanted to control who could write software for the TI99/4A, much like later dedicated games consoles, meaning crippled computers. The TI99/4A graphics available from TI BASIC are actually character based graphics (32 columns of 24 lines), using commands which make them easy to redefine and position horizontally, as well as vertically. AFAIK they’re all preceded by a CALL , then what follows is either CHAR to define, VCHAR for vertical positioning, or HCHAR for horizontal positioning. Of course, each command is followed by a list of parameters. CALL COLOR is used to set their colours and CALL SCREEN(N) is used to set the screen background colour. Luckily, TI99/4A owners were spared all the PEEKs and POKEs of Commodore 64 BASIC V2, because no such commands or their equivalents are even available on the TI99/4A. Unfortunately, for some time it was also impossible for members of the public to write Machine Code programs on the TI99/4A, because they were denied the necessary software tools, unless they worked for a software house contracted by Texas Instruments, or had paid them a large fee to develop software on cassette. Eventually, an Assembler cartridge came out which allowed TI99/4A users to write their own Machine Code programs, though. As you’ve probably guessed, there’s no mention of these restrictions in “The A-Z of Personal Computers”. They wrote that the TI99/4A comes with “Basic, Internal Graphics Language”! Obviously, a few very clever programmers somehow eventually managed to bypass these restrictions of TI BASIC as explained on http://tigameshelf.net/tibasic.htm . The official TI Extended BASIC added commands for sprites, as well as to run Assembly Language programs, but unlike with Commodore computers, it seems this may have been the only extended BASIC available, then various commercial programs were actually written in TI Extended BASIC! 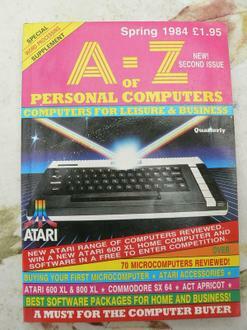 Of course, Microsoft were constantly improving their BASIC, but potential computer buyers were given no indication in the magazine “The A-Z of Personal Computers” about which computer’s BASIC was written in which year, or how many commands or keywords they had. This gave buyers no idea of the nightmare they were in for with Commodore BASIC V2 on a computer it wasn’t designed for, which even tries to print error messages on the graphics screens, that come out as coloured squares! I think they should have written something like “Commodore PET BASIC (1977)”, “Commodore BASIC V2 (1977)”, “Microsoft BASIC (1977 version)” or even “Commodore PET BASIC V2 (without commands for colour, graphics, or sound)”. Obviously, they should only have been reviewing the computers themselves and any software which was built in to them, or supplied with them, not any software which could be bought to improve them. Obviously, my Dad, as well as my Mum to a lesser extent, made the final decision that I should have a Commodore 64, instead of a BBC Micro, an Atari 400, 800, 600XL, 800XL, or some other computer. My Mum said words to the effect “It’s that or nothing!” about the prospect of a Commodore 64 without its user guide. I sometimes wonder what would have happened if I’d said “You wouldn’t buy a washing machine without a manual would you? Well, this is much more complicated!” My Dad bought the two part C64 course “An Introduction to BASIC” before we left the shop, anyway. This was all because of what I called my Dad’s IKB or IKBA (I Know Best Attitude), but which is generally known as an ITA (Ivory Tower Attitude). This means that whenever I write here about what my Dad said or did, it’s totally relevant to the situation. My Dad hadn’t read any books about computers, or “The A-Z of Personal Computers”, so he didn’t really know what he was talking about, although he liked to think he did, because of his IKBA. What he “knew”, or thought he knew was Atari=games, you must buy a computer with a proper keyboard (which this magazine called a WP type keyboard instead of a C for calculator type keyboard) because there were lots of job opportunities in “Word processing…Word PROCESSING! !”, which he said with an IKBA stare, and it should have as many K as possible, but he shouldn’t pay any more money than he absolutely had to, so roughly £200 was the limit, because there were lots of computers available for £200 or less. This type of thinking meant that the Sinclair Spectrum was a rubbery keyboard piece of crap, employers would reject you if you told them you had experience on Atari computers, the BBC Micro was overpriced and didn’t even have enough RAM, but the Commodore 64 was an ideal small business computer, even though he had no intention of buying me a disk drive to go with it. I think that Commodore were actually targeting gullible people like my Dad. That’s all for this installment! More about “The A-Z of Personal Computers” soon!! 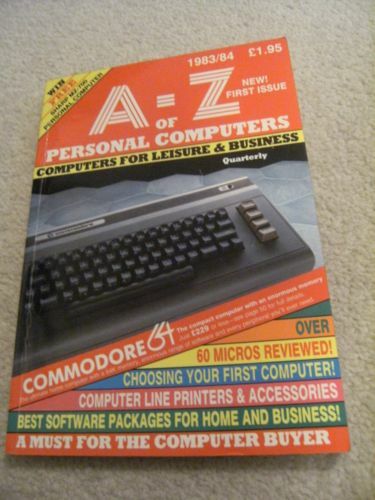 Little did I know how biased and inaccurate the information in “The A-Z of Personal Computers” was! I now KNOW, thanks to retrieving files from my old laptop, that I read Issue No. 2 back in 1984!! I never read any specialist Commodore magazines before buying a Commodore 64, because I wasn’t sure which computer I’d be getting, so I only bought magazines and books about computers in general. If I had bought a Commodore magazine, then I’d probably have found at least one listing trying to fix the Commodore BASIC V2 mess on the C64 and this would have made me investigate it further, then cross it off my shortlist. Of course, BASIC or Machine Code were the only languages which were built in to the Commodore 64 and most other computers at the time, but users normally needed an Assembler or Monitor to write in Machine Code, unless they resorted to POKEing the Machine Code into RAM from BASIC, which involved Assembly by hand. This was because most of these computers didn’t come with disk drives. The BASIC for the Sharp MZ80K was only supplied on cassette! 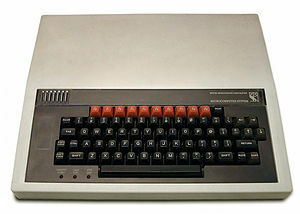 Users had to choose and buy an Assembler program to use Assembly Language/Machine Code on most computers, although the Acorn BBC Micro and Acorn Electron had a built in Assembler in their BBC BASIC, while Commodore PET computers and the Apple ][ had a built in Monitor. 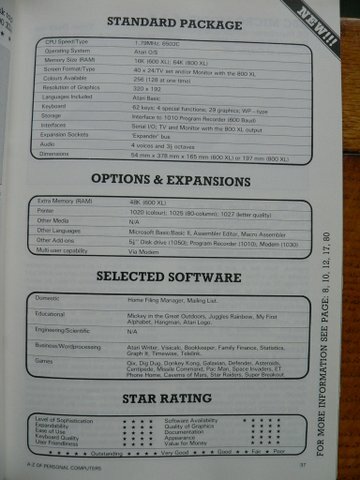 Amazingly enough, according to this magazine, the Memotech MTX computers came with FOUR languages, which were Basic, Noddy, LOGO, and Assembler/Disassembler, so it seems that in that respect they were much more advanced than any other computer in the whole magazine, which at best only came with BASIC and an Assembler. The magazine “Creative Computing” called them “the Aston Martin of computers”. Memotech’s own documentation claims their BASIC had turtle graphics, so I suppose this may be what was included with it NOT a version of the LOGO language. How could the BBC Micro Model B with advanced BASIC influenced by PASCAL and COMAL score less than the Commodore 64?! I believed all the fairy stories written in “The A-Z of Personal Computers”, which divided computers into the price ranges under £500, £501-£1,600, and over £1,600. I had to choose from the range under £500, which included all popular “home computers” of the time, except the Apple ][ and ][e, which both cost over £1,200 and were used by people in the home, as well as for business. The computers under £500 also included some small portable computers which were like overgrown calculators by companies such as Sharp, Epson, and Tandy/Radio Shack. I read the whole magazine, including details of the Apple ][, as well as the Torch PC (from £2,795! ), which used BBC BASIC, had 96K RAM, the custom CP/N OS (CP/M compatible) and had a Z80A, as well as a 6502 CPU, sounding quite like an overpriced, upgraded BBC Micro. It was absolutely impossible to get my Dad to agree to pay even £399 for a BBC Micro. He thought that about £200 or less should be enough. He didn’t know anything about computers, except how many K they had, as well as that some had better quality keyboards than others. I don’t remember how much money I had at the time, but he once offered to buy me a Sinclair ZX81 for £39.95 to see how I got on with it. I turned down this offer, due to criticism of the ZX81 for having only a monochrome display and 1K of RAM. I didn’t even know it could be upgraded to 16K or how easy to use and understand it was. People could soon grow out of the Sinclair ZX81, then they’d feel a real sense of achievement. I also knew that unless I got a computer with a more powerful spec at that time, then my Dad may well have announced one of his financial emergencies, meaning various cutbacks, and I could have been stuck with just a Sinclair ZX81 for ages. There was also a danger of financial cutbacks after we eventually sold the Commodore 64. One of his suggestions for a replacement was “That looks like a nice one! What about that one?”, referring to the Tatung Einstein, but I had to point out that it had hardly any software available. By this I meant apart from software released by Einsoft (Tatung) themselves, there wasn’t much except CP/M, as well as Spectrum software under emulation. I had some savings by then and would have gone to Silica Shop to buy a refurbished Atari 400 or 800 system on the same day, or the day after my Dad had made any announcement of a financial emergency and cutbacks. Luckily, he never did. 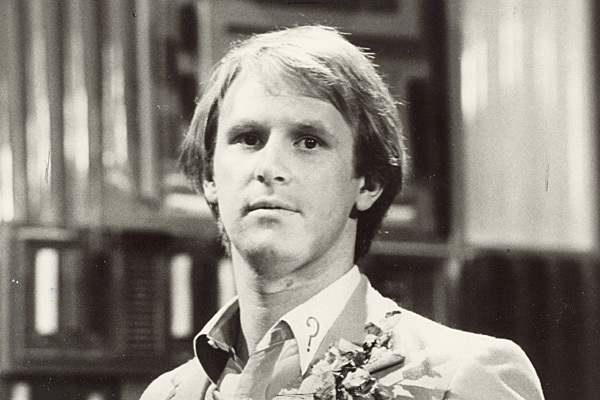 Before 1984 my Dad forced me to watch a B&W portable TV for several months (it was our only TV at the time), which included Peter Davison’s first series of Doctor Who, and he made a threat of us having to live on “good wholesome food”. The food we ate was often so boring and repetitive that I once asked him if we’d had any of this “good wholesome food” yet, but it turned out we hadn’t! This magazine included some computers which I never or hardly ever saw in real life, such as the Colour Genie, the Jupiter Ace, Camputers Lynx, a computer by Triumph Adler (which I think was their Alphatronic PC for under £500, rather than the Alphatronic P2 for £2,190), definitely the proto MSX Spectravideo 318 and 328, as well as definitely the Memotech MTX range. The Colour Genie was by Hong Kong based manufacturer EACA but this magazine claimed it was an “English Atari” because programs written by the users were encouraged (like Atari’s APX distribution system), and that it was an upgraded, colour version of their previous Video Genie, which the review points out was a mono Z80 based Tandy/Radio Shack TRS80 lookalike, but fails to mention the advanced Microsoft Extended BASIC used by Tandy and the Colour Genie, just calling it “M/S Basic”. Here’s what “The A-Z of Personal Computers” had to say about the BBC Micro Model B!!!! The reviews were very detailed in some aspects, always listing various specs, including speed of loading from cassette, number of colours, maximum graphics resolution, number of columns and rows of text. They gave ratings of up to a maximum of 5 dots or stars for the categories “Level of Sophistication”, “Expandability”, “Ease of Use”, “Keyboard Quality”, “User Friendliness”, “Software Availability”, “Quality of Graphics”, “Documentation”, “Appearance”, and “Value for Money”. I now think most of these terms are quite vague or even meaningless. 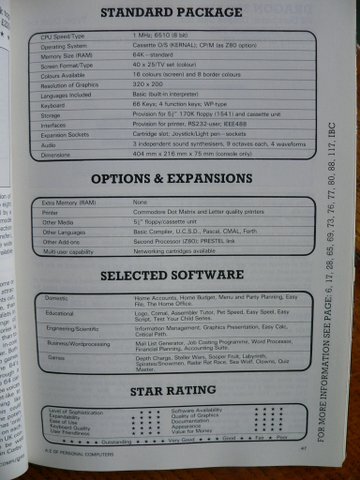 The C64 didn’t score 5 for ANY of these categories, but got 4 for all categories apart from “Level of Sophistication”, where it got a 3. They only gave the BBC Micro 3 for its user friendliness! How could this be, when BBC BASIC was written 5 years later than Commodore BASIC V2, was customised for the BBC Micro hardware, had long variable names, a command to define the function keys, as well as procedures and the facility to include Assembly Language in lines of BBC BASIC programs?! Their comments on the all important dialects of BASIC built in, which users would be confronted with as soon as they turned their computers on, were just “BBC Basic, Assembler” for the BBC Micro, “Basic (built in interpreter)” for the Commodore 64, as if having BASIC built in on ROM was unusual, and “Atari Basic” for the Atari XL range. For some other computers (e.g. Colour Genie, Epson HX-20 portable computer) they wrote “M/S BASIC” or “MS Basic”, adding “(full extended version)” for the Epson HX-20, but with no explanation of what this was, or why it needed to be extended, while the Dragon 32 and the Tandy TRS-80 Colour Computer just had “Basic”, although both companies had recently paid Microsoft for a more or less up to date version and declared on their startup screens that they used Microsoft BASIC, as well as a then recent Copyright date, such as 1982! Obviously, at about the same time Microsoft were updating their BASIC yet again and supplying it to Spectravideo, as well as the MSX Consortium, but Commodore couldn’t have cared less!!!! The Commodore VIC-20 also came with “Basic”. An article near the front of the magazine showed a copy of Microsoft BASIC as part of a course by ICL, who produced some kind of very expensive business computers and terminals at the time. The Camputers Lynx seems to be an excellent computer, which the review explains has graphics commands of “Draw, ink, Move, Paper, Plot, Print and Window”, but no such command listing is given for any other computer, so I assumed they would all have commands which did the same or similar things to the Camputers Lynx. This is where an Editor should have stepped in to tell the staff to add these command listings to all reviews for comparison. That’s enough about “The A-Z of Personal Computers” for the moment! This series of articles will continue very soon!! I’ve been working on this article for some time and have now decided to divide it into a few parts. 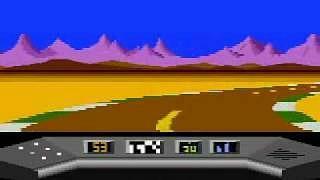 A pic displayed on an Atari 8 bit computer, showing how much better than the C64 this system is! This edition says that the market for computers was still in its early days and their reviews of some recently released computers say that, although they haven’t got much software available, this could change in the near future. In spite of this, the magazine said that the Texas Instruments TI99/4A only had 65 commercial programs available for it. Don’t forget that even though that computer was soon killed off by Commodore’s price war, its graphics chip was used in various other computers and consoles, including Memotech MTX, the Tatung Einstein, and MSX. In 1983 there was no standard for business computers, either. All the computers listed could be called PCs, standing for Personal Computers, instead of computers used by more than one person at a time, such as mainframes or minicomputers. The IBM PC had been released and was tipped to capture only as much as 20% of the market! Other business computers often used Z80 processors and ran CP/M, while some had 8088 or 8086 processors and ran CP/M 86, their own custom DOS and/or MS-DOS, but weren’t hardware compatible with the IBM PC, although there were some which were hardware compatible with the IBM PC, but I’m not sure they’re listed in this magazine. 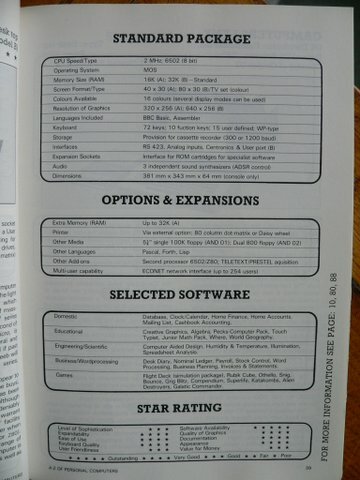 There was also a system called UCSD-p which was a hardware independent OS for 8 or 16 bit computers, that ran on various computers as an alternative option to MS-DOS or CP/M. I tried to get as much information as possible about different computers, including reading a book called “Micro Computers”, which may have been published by Penguin Books, one or two issues of the magazine INPUT, as well as visits to my local computer club, where at the time all the BASICs and/or other languages looked like total gibberish to me. I ended up standing by an Apple ][ watching games such as “Swashbuckler” on a mono green monitor, while waiting for an explanation of what was going on around me or with computers in general. It seemed to me that the A-Z of Personal Computers had more information about computers than anyone else. They pointed out that their information was all available in a single edition, unlike other magazines, so I thought that was a good idea. The magazine “What Micro?” is mentioned in this magazine, but I don’t remember reading it before buying a Commodore 64. If I had, then it may only have had reviews of computers which had recently been sent to them for review, but I’ve recently bought a copy of their February 1983 issue a listing of every computer available for under £6,000! I think they probably had this in ALL their issues. So, that tells you about how I came to buy, read, and believe in “The A-Z of Personal Computers”. Now you can look forward to reading how this magazine made me think that the Commodore 64 was an excellent computer, with amazing graphics and sound which was an suitable choice for me to learn how to program games and music on!!!! TMR has basically said that the impressive, technical, German magazine 64’er was totally irrelevant because it was in German and not even available in Britain in 1984-1985. 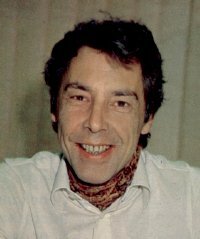 Editor Michael Pauly appeared in pictures accompanying his Editorials in 1984 wearing a cravat, so as suggested in the Doctor Who spin off series “Torchwood”, I can’t help wondering if he was a time traveller who came back in time from the future, after visiting the early 20th century where he wore cravats. After getting addicted to cravats, he may have travelled back in time to the 1980’s to improve the situation for Commodore 64 owners, using his knowledge of 32 bit, 64 bit, or 128 bit computers. I pointed out that I thought the lack of availability of 64’er magazine in Britain was due to “language censorship and lack of distribution”. There were actually subscriptions to various magazines available through a company I can’t remember the name of, but who dealt with magazine publishers on the Continent, such as Arnoldo Mondadori in Italy, as well as with other companies who organised the subscriptions, such as DPV (Deutsche Presse Vertrieb) now available on http://www.dpv.de/ . 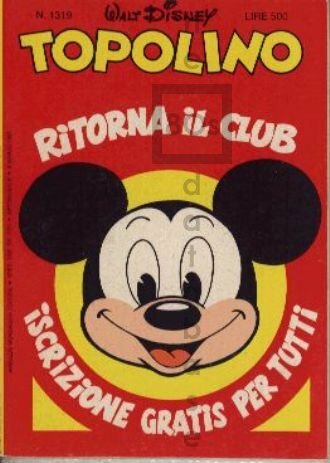 I was reading a Walt Disney comic published in Britain, when they suddenly published a reader’s letter about some Walt Disney magazines from Italy called “Topolino” (nowadays on http://www.topolino.it/ ) and from Germany called “Micky Maus” (currently on http://www.micky-maus.de/ ). I was very interested in these and I even managed to get one or two issues of “Topolino” from a newsagent in a London tube station, but it was very hit and miss. Later, my Dad managed to get subscriptions set up for me. After visiting their office, my Dad brought home a sample issue of the more well known French magazine “Pilote” http://en.wikipedia.org/wiki/Pilote , but I didn’t know what to make of it, so never got a subscription to it. 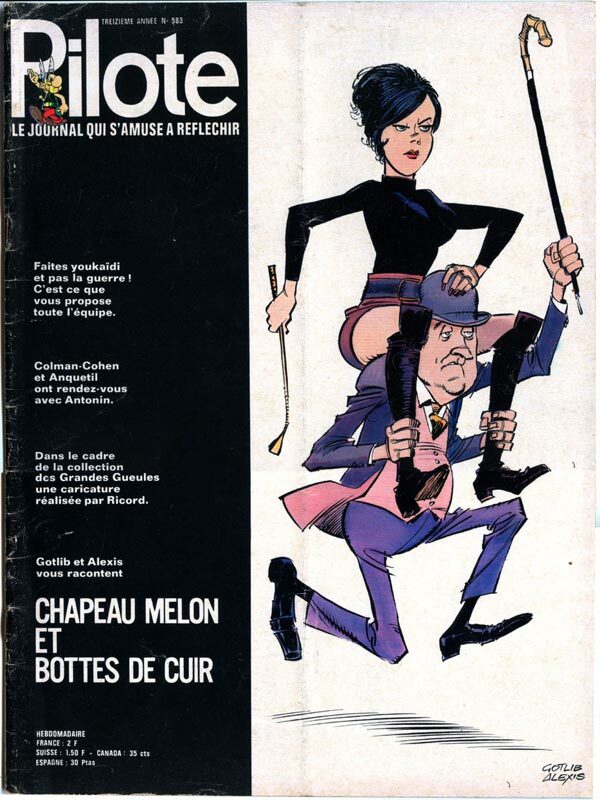 It seems the magazine “Pilote” had a quite long run, with weekly, as well as monthly versions. It featured comic strips of characters including Asterix, Achille Talon, and Blueberry. As for “Topolino”, they actually created some of their own characters, such as “Paperinik”, which was Donald Duck as a super hero, later published as “Super Duck” in English language versions. Of course, this was years before I got a Commodore 64 and I hadn’t actually heard the titles of any C64 magazines published in Germany. I didn’t know there was any point me trying to get hold of them either, so I just pored over the official Commodore books, as well as British Commodore magazines, but it was far worse than trying to do geometry! Of course, I wasn’t talking about shipping 64’er magazine “around the World”, just a bit further than it was already distributed to. “Micky Maus” magazine even had cover prices for the USA and Canada. A magazine distribution company called COMAG could have distributed 64’er magazine, but they seemed to mainly distribute US magazines. I think that London would have been the most likely place it could have been made available, especially newsagents in tube stations, and the main railway stations, such as Victoria, Charing Cross, Kings Cross, Liverpool Street, Waterloo, and London Bridge. Other good locations would have been Foyles bookshop, and Hampstead, because a seller of live bootleg tapes from there told me “They’re mainly German or Jewish round here”. I’ve tested this on my C128 in C64 mode and it works! Here’s a short demo of this, where I even managed to program a simple scroller! Unfortunately, I haven’t been able to find the 64’er POKEs which didn’t turn off the ROMs in the C128 in C64 mode, but one suggested by TMR some time ago for the C64 was the Assembly Language equivalent to POKE 1,53. I’ve now found out that POKE 1,53 sometimes does and sometimes doesn’t work. If you type POKE 1,53 immediately after starting up in C64 mode, then the screen freezes, and the “READY.” prompt doesn’t reappear, but if you first of all give the roundabout DIRECTORY substitute command LOAD”$”,8 , or load a BASIC program first, then POKE 1,53 doesn’t work! The magazine 64’er actually published the 1541 disk drive fast loader Hypra Load, so it had a lot of publicity, but I don’t remember similar listings in any Commodore 64 magazine I read. Of course, I couldn’t have used them because I didn’t own a disk drive. Later on, in their issue 01/85 they published some extensions and improvements to Hypra Load, including ways of transferring it to cartridge or even making it part of an improved C64 OS on a replacement ROM! A short program I adapted from a 64’er SIN curve program draws a straight line across the screen in BASIC V2. I never ever managed to adapt the Commodore 64 Programmers’ Reference Guide program which drew series of dots as a SIN curve to do anything else except SIN curves, obviously because that program was as clear as mud! Here’s my line drawing program based on the 64’er SIN curve program. It seems the main change is in line 90, where my REM indicates a function I’ve deleted. At the moment, there’s an archive of 64’er magazine disks available on ftp://arnold.c64.org/pub/magazines/64%27er/64%27er/ , so if you’re interested in seeing for yourself how amazing their program listings were, download the disk images from there ASAP. Some of programs have partly English text, while others are totally in German, so here’s some vocabulary for you, from some early program listings they published. In this list German characters aren’t used, because they weren’t used in the original listings, but normally ae = ä , oe = ö , ue = ü , and sometimes ss = ß . 64’er magazine published some programs which gave the C64 a German character set and my German model C128 has a key that switches into a German character set, which even works in C64 mode, though. Noch einmal? – Another go? Wurde schon eingegeben! – Already inputted!